Many years ago, as I set off to take up my new position in Dubai, little did I realise the magnitude of the change that was about to take place in my life. There were mixed reactions from my family and friends when I broke the news about having taken up the job offer. Some of them feared for my safety as I was moving to a war torn region of the world. Many of my friends warned me of the perils of moving to an Islamic state. Some of them even recommended a few books that I should read so that I could understand the country a little more. Every job change is a difficult one. But this one was turning out to be a lot more difficult than I had initially anticipated. I remember stepping out of the airport at Sharjah where a burly khandura clad local man waited to pick me up. It must have been a little past midnight when we left the airport en route to Dubai. The very old Chevrolet Caprice was not the idea of a taxi I had imagined. It was dirty and the seats seemed to have weathered many summers. The man did not speak English and I never understood anything of what he said to me. In fact he spoke very little since we shook hands at the airport. The drive to Dubai must have taken what seemed like an hour. I remember imaging all the terrible things that could possibly have happened to me during the drive. That night I cried a little as I lay in bed, anxiously waiting for my new life in Dubai to begin. Today I feel proud and in some ways lucky that I chose to make the change. Since moving to UAE, I have grown as much as I have seen this beautiful country transform itself. What UAE has achieved in the last few decades is some thing many countries have taken over a century to accomplish. Today UAE is a shining example of how enormous change and growth can be achieved in such a short time. From the tallest building in the world to the largest and glitziest malls, it is all happening right here. I am sure UAE will score high across most measures of success. I am amazed at the stories of success I see everywhere. UAE is an international tourist and business centre as well as a modern, safe and stable country for its residents. It boasts of one of the highest per capita income in the world. UAE is home to over 100 nationalities who make a wonderful mosaic. Today everybody wants to be here! Many of the fears I felt as I set out for Dubai have been laid to rest. I feel safe here. My family feels safe here. I feel I live in a relatively fair system where I am not treated in any way differently. Contrary to perception, I find that the system here is relatively fairer to expats as compared to other countries. I can practice my religion freely. Not many of my friends back home believe I attend weekly church service without hindrance. So is it too good to be true? Like every country, UAE too has its own share of challenges. In many places, the pace of growth has far out striped the pace of changes in its legal system. I can see many things that need to be changed. And quickly. But what makes that big difference is that many of these challenges are being addressed as I write this. Head on. Never for a moment can I doubt the transformation that the leadership has brought about in the last 41 years. Success is all about how much better we are as compared to yesterday. Its about how much further we move every day. 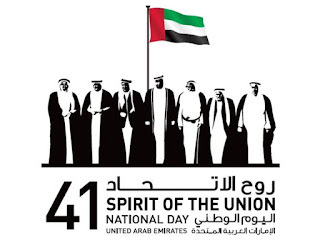 Today as UAE celebrates its 41st National Day, I wish its citizens and residents on this happy occasion. We all need to contribute to the success of UAE as much as we expect the government to play its role. You made some decent points there. I looked on the internet for the issue and found most individuals will go along with your post. Great Country, i am part of this country. May God Bless its Rulers and their family on there 41st National DAY. Yes Buddy You are 100% Right.!! Almost a Year ago We (My Mom and me) Shifted To Abu dhabi and When I Go Outside It's the Best Place to Live Till Now I've Ever Seen.My Dad Doing Job here From Last 18 Year's.When He tells me that How U.A.E Have Grown up in just few year's I'm Amazed alway's.